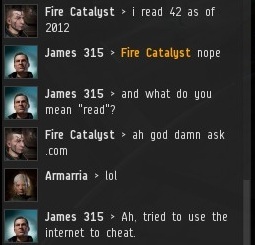 Previously, on MinerBumping... Hydra Fire had a chance to win 25 billion isk from Erotica 1. Hydra followed the rules by contracting me all of his in-game assets, but forfeited everything by lying to Erotica. He claimed to have secreted assets away on his alt, Fire Catalyst, but this turned out to be another lie. In a last-ditch effort at redeeming himself, Hydra invoked the Supreme Protector's Questions Three. The atmosphere became remarkably tense once the Questions began. All of Hydra's assets were in my possession. 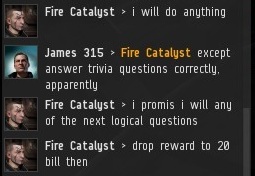 If he answered each question correctly, he would win all of his assets back, and would be awarded 25 billion isk. 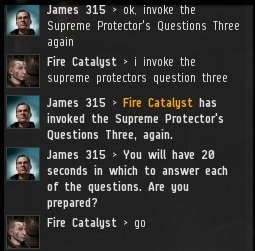 Hydra's future in EVE would be determined in the next few moments. The Supreme Protector's Questions Three have been invoked several times since I became Supreme Protector. Sometimes I'll ask brand new questions, but other times I'll ask questions that have already been used--even if they have already been seen in previous blog posts. Would Hydra get a new question, or would he luck out? A tremendous sense of relief must have washed over the onlookers in Erotica's bonus channel. I asked the most commonly-used question. It has been featured in five previous MinerBumping blog posts. ...But Hydra somehow managed to muff the question anyway. Like so many others before him, Hydra incorrectly guessed that the Nile was the largest river in the world. It was a huge disappointment to everyone. Despite the many betrayals he had committed, I felt sorry for Hydra. I love handing out prizes, and I wanted to see a great redemption story. But the rules are the rules. Hydra went back into "bargaining" mode. With no in-game assets to speak of, he was desperate. 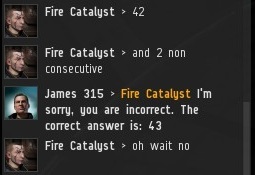 He had come so close to becoming a rich EVE player, but instead had to start again from scratch. Erotica and I had already given Hydra so many chances. He couldn't ask for any more breaks. But it's not for no reason that my name is synonymous with mercy. Hydra agreed to put a pledge of loyalty on his character's bio in exchange for another crack at the Questions. He was willing to put it on Hydra Fire's bio as well, but I didn't want him to have to go through the hassle of re-logging on his main. Again, mercy. Hydra was more confident this time. Having been given so many chances to redeem himself, perhaps it was his destiny. Maybe there was something to this "destiny" thing, because Hydra had another extraodinary stroke of luck: I asked the same question that had been featured in a MinerBumping post earlier that month. Hydra took all of the 20 seconds to type out his answer. In a horrifying twist, he answered incorrectly. Hydra was crestfallen. It was all over for Hydra. With nothing left to lose, he confessed that he used the generous 20-second time allotment to try looking up the answer on the internet. Hydra appears to have found this Yahoo! Answers page via Ask.com. Unfortunately, the page predated Barack Obama's presidency. It is unwise to take shortcuts in this life; Hydra was taught a valuable lesson. Hence the whole "Test of Wisdom" thing. That was it for Hydra. Though I mentioned my blog earlier that day, he hadn't read it yet. This is a mistake. 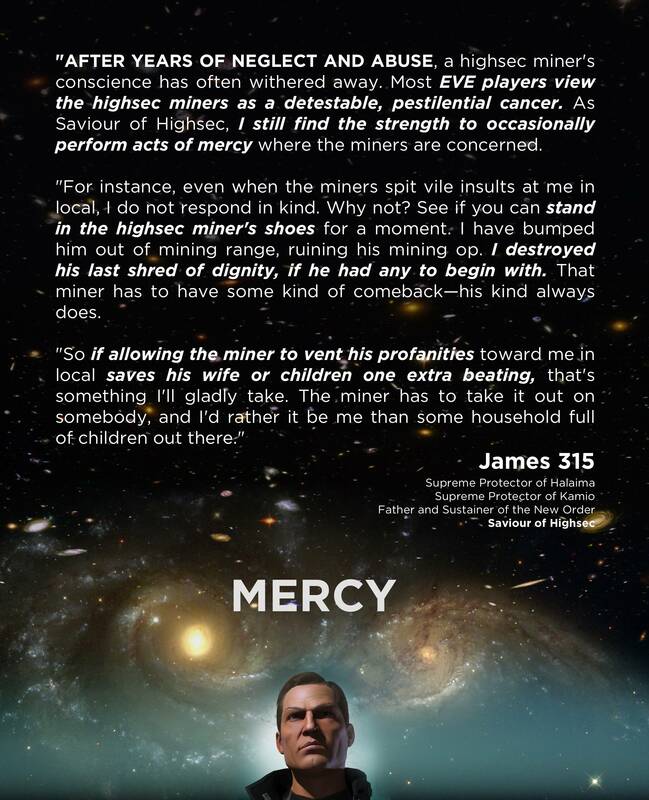 EVE players should always read my blog--you never know when it might come in handy. I requisitioned Hydra's forfeited assets for use in future New Order activities. We stayed on "good" terms, possibly because Hydra was still hoping to get his stuff back. Hydra and Erotica remained in contact. Though Hydra's attitude about Erotica was subject to dramatic shifts, he did at least admit that he was guilty of deceit. This is proper, and Hydra is better off for saying it. But it is a far, far better thing to act with honour and integrity in the first place--especially if you want to double your isk. He learned something about honoring his commitments, trusting unknown persons, and being responsible for his failures. This is far more important than a a large slug of video game "money". Why does the Whitehouse list 44 presidents? as does Wikipedia? Is it a trick question? 43??? Even if you count harrison's time and say 44, his main answer was incorrect of 42. I don't know why he'd split up the answers with the "and 2 non consecutive" That doesn't matter from the context of the question. It's been awhile since I've had an American Gov't class of anything. But I do remember some sort of discrepancy between one or more of the US presidents. And that might be harrison, I don't remember and can't look anything up at the moment, am interested now so will do some research later. 44 Presidents but 43 men as Grover Cleveland had non consecutive terms and counts as the 22nd and 24th President, but is still only one man. It is a good question. On both lists at first glance it appears as though there were 44 presidents however they count Grover Cleveland because his terms in office was interrupted. Thank you Capt Starfox and Anonymous 13.17. I just had the chance to do some research as well and seems that Anon 1:17 has provided the information already. No problem Bobbins, was interested too. Glad to find out the reasoning behind the 43 men as presidents, yet 44 "presidents" in office. Once a scammer always a scammer eh James? The only unbelievable thing is that there are players in this game stupid enough to give you all their assets. 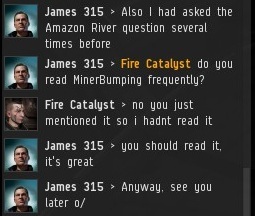 No...not that there's anything wrong with scamming in EVE. It is a respectable and praiseworthy profession in a game such as EVE. I'm trying to figure out what the scam was? 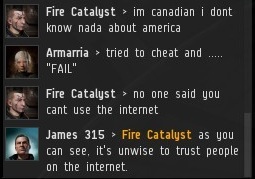 Hydra broke the rules by lying, several times. Now I will sort of agree on being stupid and giving strangers on the internet all your stuff. Normally that would be very stupid. But James and Erotica 1 are not your normal internet strangers. They are the savior of hisec and the only legitimate isk doubler respectively. So of course, completely trustworthy. 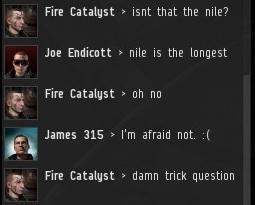 If anything I think this proves that highsec people not associated with the "New Order" are horrible dishonorable people. 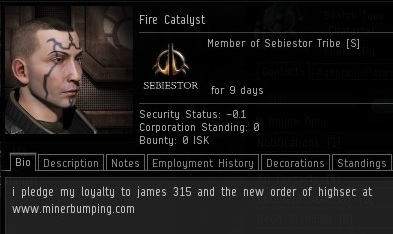 For those that want out of highsec, I happen to be a recruiter for Goonwaffe.